Vegetable Egg Muffin Cups If you don't have time to cook in the morning, egg muffin cups will be your new best friend. The recipe can be made in advance and the portable cups are perfect for when you're dashing to the office. 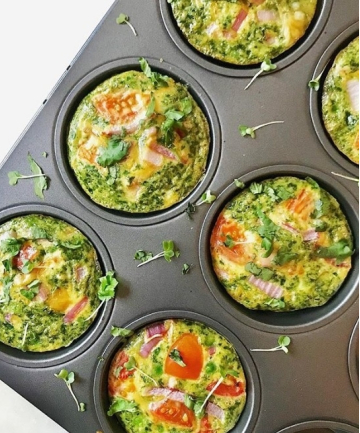 These vegetable-packed egg muffins offer plenty of nutrition and vitamins thanks to spinach, mushroom, peas, red pepper and more.